We revisted the valley later in the week. The clouds were low over the tops of the mountains and the distance melted into whiteness. The little river Ogwen wound its way across the valley floor and the single track, switchback road disappeared off over the side of the mountain. I'm just back from a week painting in Wales with friends. 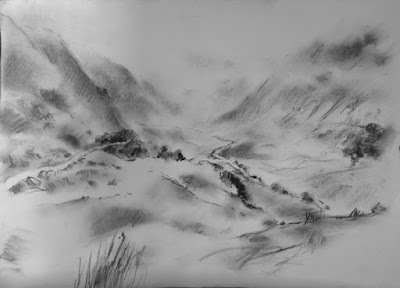 Wales + mountains means we knew there would be rain - but it made for some lovely atmospheric scenes to sketch. 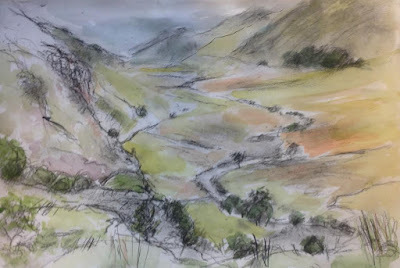 Friend Ros, that I travelled with, and I stopped on the way in a beautiful valley I last saw about 20 years ago when my daughter was at Bangor university, I was determined to get there to paint again. Nigel another member of the group met up with us there and we all got thoroughly wet and bedraggled sketching.